WordOfGraceChurch: 5 Reasons why you shouldn't lead this Sunday! 5 Reasons why you shouldn't lead this Sunday! Worshiping as a part of the congregation and not leading it. We have just returned from our family holiday in Mumbai. One of the good things of being away from your own church and being part of another congregation is , that it gives you fresh perceptive. You see things you otherwise don't and you also get to experience things from a visitors perspective which you don't get when you are in your own church. I recently came across this article which is provoking, stimulating and has articulated some of the things I experienced as a visitor in another church.It also made me reflect on how we do things vis- a- vis what I experienced.This resulted in me making mental notes of what I'd like incorporate and what I'd like to adjust for the future. Reading this article and reflecting upon it I believe , will help us worship leaders keep our edge while making sure we make room for others to grow. 5 Reasons why you shouldn’t lead this Sunday. By Fred McKenon. Have you ever thought about what would happen if you didn’t show up to lead on a Sunday? Would your leadership team be able to adjust? I’d like to suggest five reasons why you should not lead worship this Sunday. OK, maybe not THIS Sunday in a literal sense. But let’s entertain some valid reasons why you should be prepared to not lead and remove yourself from the platform every now and then. When was the last time that you participated in a worship service as a congregant? This perspective can be very enlightening to a worship leader. By joining in with the congregation, you can get a first hand feel for what your sound is like, how your team’s stage presence is represented, how transitions flow, and what may be helping or hurting the overall environment that is being created. Can you hear one another sing? Is the lighting sufficient? Are people around you engaged in corporate singing or are they just watching the performance? All of these can be more easily discerned from the vantage point of a worshiper in the congregation. One of the biggest reasons that you need to get off the stage every now and then is for the empowerment of other leaders. Any worship leader should be intentionally mentoring and raising up additional worship leaders. You may have to start from scratch, or you may share in the huge blessing that I have where you’re already surrounded with a plethora of strong worship leaders. Either way, stepping aside and giving them the opportunity to minister will build depth in your team, empower others, and bring a fresh approach to worship for your congregation. Let’s face it. We may try our hardest to diversify our setlists, but we’re still prone to sing songs that we’re most comfortable leading. By getting off the stage and allowing someone else to lead, we open the door for stylistic diversity for our congregation. If you typically lead worship with a guitar, it may be refreshing to have a service that is more keyboard led, and vice versa. Perhaps you have someone else who brings a different sound and style altogether, which can be a refreshing change of wind in your musical selections and delivery. We should always be living our lives in such a way that we’re constantly engaged in direct, personal worship. If Sunday morning is our only time to worship, we’re already in trouble. However, there is something wonderful when we can step off the stage and worship freely without the concerns of leadership. By taking some time off the stage, we accomplish so many other positive things for others, and it can give us a wonderful time to worship freely. 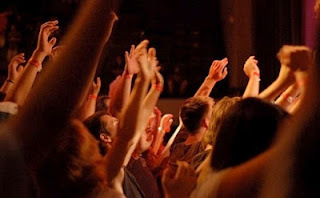 I truly believe that when a congregation notices their worship leader standing with their family engaged in authentic worship, it deepens the trust and connection that would exist between the leader and the people he or she is leading. Can you imagine how your children’s director would respond if you said “hey, next Sunday I’ve asked one of our other worship leaders to lead, and I’d be honored if I could come in and lead the young kids in a few simple praise songs.” C’mon. That would be amazing and you would be immensely blessed, as you are being a blessing. I truly believe it’s a mistake to force a worship leader to always lead, every week. There is so much to be gained from a plurality of leadership and from giving a leader the chance to remove themselves from the spotlight, even if the only thing accomplished was a day of rest.